Central Illinois Family Owned Jewelers – Offering three bench jewelers with over 100 years combined experience. 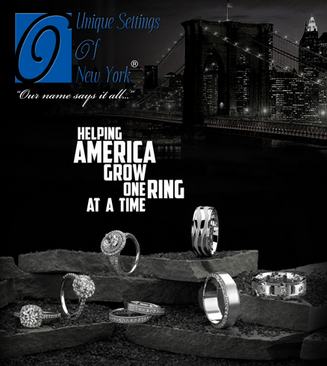 Roger Burke Jewelers is proud to carry Unique Settings of New York. Unique Settings manufacturing, and distribution facilities are located in United States that makes “Made in USA” a symbol of quality and value that our customers can rely on. Our New York manufacturing facilities produce our entire product line. We are dedicated to continue the commitment of our products being MADE IN AMERICA. Over 20,000 designs from important basics to current design trends. The most comprehensive selection of bridal and anniversary designs in the industry. Our entire line is available in 14K and 18K, white, yellow, pink as well as 950 platinum and 950 palladium. All rings available in most finger sizes. Wax adjustments on all styles as needed. Model making; both CAD and HAND CARVED. You can request most rings as two tone. All precious metals at Unique Settings of New York ® are 100% recycled. We only buy our metals from earth friendly refineries and only use recycled precious metals. All of our diamonds are conflict free and come from sources that are full participants of Kimberley Process. 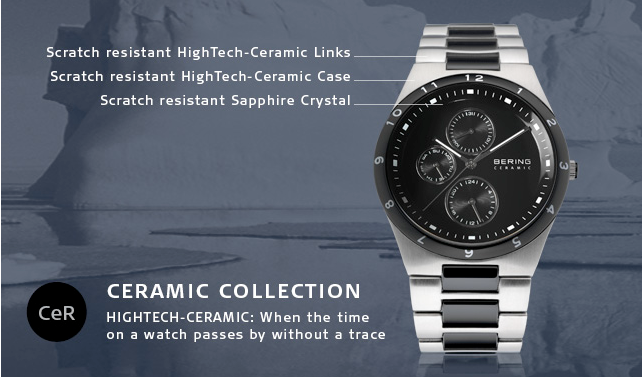 Stop by Roger Burke Jewelers and check out the new collection of BERING watches. that ensure long durability and unite perfectly with the slim design. When the pure, cool beauty of the Arctic is blended with the simple elegance of Danish design, a new era dawns: it’s Bering-Time. Roger Burke Jewelers has three local bench jewelers with over 100 years combined experience. Providing the highest quality jewelry and repair at very reasonable prices with unequaled customer service in the Peoria area. Our full suite of jewelry repair services includes ring sizing, mountings, stone replacement, retipping prongs, jewelry cleaning & polishing, necklace repair, bracelet repair, clasp replacement, refurbishment & custom jewelry designs. Did you know that celebrity Kelly Ripa’s Gold Sideways Cross Necklace was never off-center, but just happened to be photographed that way? The off-center trend emerged from those photographs. Jewelry has long been a way of expressing our individuality. Many of us are always on the look out for unique new jewelry pieces to add to our collection. Recently, a new trend has emerged with the introduction of the sideways cross necklace. An interesting twist on wearing a cross-shaped pendant, the cross is attached to the necklace chain at the top and bottom of the cross, resulting in it hanging on its side or laying down. Stop in today to see our wide variety of sideways cross necklaces starting at $199.00. A real eye catcher! The 14k gold four prong setting shows off this large approximately 8.0 x 12.0 mm oval shaped mystic topaz. Topaz hangs from an 16” yellow gold rope chain with spring ring clasp. 14k White Gold Swiss Blue Topaz Earrings set in a four prong setting. The Swiss Blue Topaz Earrings in 14k White Gold feature a oval cut Blue Topaz approximately 5 x 3 millimeters. Classically stylish these .15ct round diamonds hinged hoop earrings in 10k white gold will make any girl smile. This lovely 14k yellow gold ring features a 4-5 millimeter freshwater pearl flanked by diamond accents. Make a statement with a colorful alternative to classic pearls. The freshwater chocolate pearls are knotted and are 16 inches in length. The pearls are 7.5mm to 8 mm and have a 14k yellow gold clasp. Sophistication at its best a 14K yellow gold diamond omega slide pendant with .25 carats of diamonds set in a channel setting. The charm is 8 millimeters by 10 millimeters. This unique pendant consists of 14k yellow gold features two round brilliant diamonds. Suspended from an 16″ yellow gold rope chain with spring ring clasp. Crafted in 14-karat white gold, this beautiful and whimsical butterfly pendant features round brilliant diamonds with a total weight of .30cts. Suspended from an 16″ white gold rope chain with spring ring clasp. Copyright © 2019 Roger Burke Jewelers. All Rights Reserved.